The 1916 Song Project was a research and performance project devised and produced by Michael Fortune and Aileen Lambert. The project featured ten traditional singers from throughout the island of Ireland who composed, researched and presented a body of traditional songs based on the 1916 Rising and the events surrounding it. Concerts took place throughout Easter 2016 in Dublin City, Dun Laoghaire, Fingal, Meath, Galway and Wexford, places where there was significant activity during Easter week. For the project, Paul composed a song entitled ‘The Rise of Wexford Volunteers’ which was premiered during the Easter Monday State Commemorations in Enniscorthy on March 28th, 2016. Debut album from Wexford based four piece band, playing trad infused songs and tunes from both sides of the Atlantic. Stephen O’Leary – Vocals, mandolin, guitar. Martin Sheehan – Vocals, bodhrán. Paul O’Reilly – Vocals, guitars, banjo-guitar, bouzouki. Mick Folan – Flute, whistles, bouzouki. With lead vocals by Paul and Helen Kirwan, and performances by Paddy Berry, Padraig Sinnott and Tom Murphy, this album is a document of the past, a recording of hits of their time; hits that never made the charts but brought so much joy, and sometimes controversy, to the people of the day. As well as vocals, lilting and whistling, Paul also plays guitar, bouzouki, bodhrán, mandolin and whistle on the album. It was recorded and mixed by Paul in his studio in 2008/9, and mastered by Aidan Foley at Masterlabs. The cover image is a painting by Paul’s good friend, and Wexford artist, John Cullen. The booklet contains 28-pages, containing all lyrics and a background-note by Paul on each track. The total running time is approx. 130 minutes. When one looks for heros in our tradition, Art Sinnott and Paddy Berry are national treasures. They’ve carried the flame through good and bad, and both inspired and preserved for us the wealth of beauty that is our traditional music and songs. They did so out of a deep love of place, as well as the joy that this music brings. I am happy to say that with this CD the flame is in good hands. This is a Jewel, a record of our local history, lovingly performed with the sensitivity of those who understand naturally how this music should be treated. The singing is wonderful and the accompaniment tasteful and restrained as is Paul’s production, allowing the songs to tell their story and transport us to situations both moving, joyful, humorous, and stark. Some material never before recorded, as well as a brilliant new song from Paul which shows the depth of talent on show here. It is fitting that the tribute to Art Sinnott (who encouraged me to keep going on the uilleann pipes) should be sung by Paddy Berry, another hero of mine. It’s like a link with the unbreakable chain of friendship, respect for those who championed the music and a deep sense of passing on the torch, which is what traditional music is all about. Thank you Paul, Helen, Padraig Sinnott, Tom Murphy and Paddy Berry. The Poet’s Dream is simply beautiful. I’m sure Art Sinnott and MJ O’Reilly are very proud. The completion of any complex and difficult project is worthy of praise, but I had glimses of what was attempted here with THE POET’S DREAM. I would have to say that courage, persistence and most of all sensitivity to the material, the memory and indeed the tradition shines out in this production. I would also have to say that in everything that has been attempted they have been successful beyond any evaluation and even I would say, their own high expectations. Without equivocation or condition I would have to say that this is a fabulous piece of work and a realisation of the all its aspirations. The connection on THE POET’S DREAM is that these are all Wexford songs but with a very distinctive Monageer flavour and hugely influenced by the Cooper and O’Reilly dynasties. Eighty percent of songs are from these two families. They are all folk songs, some have accompaniment, some without, but all are reflective of the tradition of singing in Wexford and how it has evolved and indeed continues to evolve in the great sea of time, occurrence and travel. This is not just an album of folk songs, but a whole lot more. It provides a panoramic view of an area over 150 years, and not through historians or commentators but through the voice of the population. I know Paul and Helen well as both artists of the highest calibre and people. There is nobody better qualified as singers to perform these songs, and their connection to these songs goes a lot deeper as blood, family and songs are intertwined here. Paul’s connection to the album is through his late father, a giant of traditional song, and grandfather and relations. And we are reminded of this only recently with the death of the late Liam Cooper, which re-inforces the necessity for this type of project. Helen too comes from a family steeped in music and folklore. Her father Art Sinnott was one of the most outstanding men of 20th Century and gave us our anthem. And what of the songs? There are slow songs, fast songs, local and national songs, political, satirical, songs of work, fleadhanna, ’98, The Strawberry Fair, hospitality and songs about our love of place. D’Arcy’s House is a song full of fun and humour and also a song with a smile. But there is an extra delight as the album ends with a breathtakingly beautiful song composed by Paul – The Wild Geese of Killyleagh – demonstrating that not only is the craft moving on to new generations but, if anything, is even improving. To finish, THE POET’S DREAM is more than just a fabric, it is a magic carpet that can whisk us to our past, present and future. It is A BRILLIANT PRODUCTION. Here is a beautiful double album of songs old, new and renewed. O’Reilly and Kirwan have produced a collection of 26 songs that span a wide timeline but even with this they manage to sound melodious and to hold the listener’s attention through the 130 minutes of running time. The album is Wexford-based in that most of the songs are written by local poets and songwriters or about events that occurred in the county. Many of the songs were published in ‘Wexford Ballads’ by Paddy Berry over twenty years ago and it is a revelation to hear them performed in their full musical glory. Like the best of ballads they are true story songs. Nowhere is this more evident than on songs like The Battle on the Hill, a wonderful recounting of a fight, complete with names and places. Farewell to Art Sinnott is one of those sean nós songs that is redolent of feeling as we hear the writer and singer echoed as they recall a true loved one. Being a Wexford collection, 1798 is seldom far from the singers vocal chords. True to form there are a number of renditions of songs of that era including The Men of Ninety Eight and The Adolescent Patriots being just two of them. In a more lighthearted vein we get a song written by Babs Egan that reminds us of the hunt on Tally Ho. The Jolly Butcher is another ‘naughty’ story song that has probably done the rounds in many an Irish town over the years – here he arrives in Enniscorthy. One of the most popular Wexford exports is John Barry – founder of the American Navy. He is represented here as Jack Barry in a song collected decades ago for a book called ‘Songs of the Wexford Coast’. The album is a wonderful collection of music but it is also history in verse and music. It is the history of Wexford but it is also a history of a tradition, a tradition of how our forefathers celebrated incidents and people in song and story and as such is a document of Irish social history. The accompanying booklet is well produced with lyrics and background to the songs. Original and unusual … a fine production. The arrangements give the album a sense of continuity; when you listen to song number one right up to song number twenty six, you can see the link, the thread, through them, and this is important when the collection is mostly from one or two sources. A very, very fine collection of songs from different parts of the county. 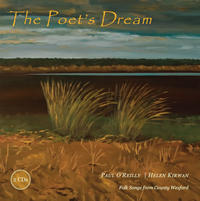 This collection is produced to the very highest of standards … The way in which a tradition of balladeering that extends over five generations has been presented as a coherent whole on the album is very impressive … While The Poet’s Dream is mainly about the human voice, putting previously unreleased songs on record, it also serves to underline the versatility of Paul O’Reilly as an instrumentalist. A brave and inspiring project, remembering some of the best and most prominent Wexford songs composed during the 19th and 20th centuries. The singing and accompaniment is refined and graceful, it is about the songs and their stories not the singers’ ego. I was bowled over by The Poet’s Dream; a masterpiece. A great album. There are some songs on it I heard perhaps only once, and I often thought what had happened to them. But here they are now, written down in front of me. The Poet’s Dream is a considerable achievement and one of great emotional significance. This is not lost in the renditions of the songs and knowing that there is such a special connection between singer and song always increases the listening pleasure … It is obvious that a lot of dedicated creative work has gone into the making of this recording. You are not just ‘getting them down’ but sending them out in full flight. The design, research and presentation are first class. Seriously good in so many ways. The singing, playing, production, everything is really amazing. It is a true labour of love and a really vital part of Wexford’s musical tradition. Listened to CD last night and it’s absolutely brilliant. Well done! Whisht! performed in the world premiere of Harbouring for multiple choirs and string orchestra in White’s Hotel Conference Centre, Wexford, June 2008. Commissioned by Wexford County Council Per Cent for Art scheme. Composed by Ian Wilson, the performance featured: the Irish Chamber Orchestra, Wexford Festival Singers, Enniscorthy Choral Society, Gorey Choral Group and Whisht!. WHISHT! brought a powerful tonality to the choral and string orchestral harmony. These distinct tonalities brought three forces together and created the sound world, which coloured by the haunting accordian brought us to many unusual and personal harbourings. Whisht! traditional singing group provided excellent tremelous vocals on Macquarie Harbour which is spooky and atomspheric … Currach features excellent vocals from Helen Kirwan, with the male vocals equally strong. 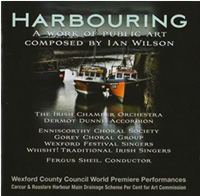 It is an intimate, genuinely moving performance, with hushed playing [from the Irish Chamber Orchestra] during which you could see a sudden tremor of life in the conductor’s [Fergus Sheil’s] hand as he went about his work … The Harbour was written by Irish poet, Winifred Letts, and speaks of the Wexford coastline. It was an ideal finish to the musical event, including all of the choirs, with a paroxysm of emotion provided by Paddy Berry of Whisht! Currach, by Tony Curtis, was sung by Paddy Berry, Helen Kirwan, Paul O’Reilly and Niall Wall with delicate monochromes, and a vocal beauty at once as fleeting as wild tulips. The Cuckoo’s Note was recorded in 2007 at Liam Clancy Studios, An Rinn, County Waterford. Engineered and mastered by Kevin Evans, the album was partly funded by the Arts Council. I was driving to Clare and when I put in the CD I was absolutely taken by what I heard. And I was surprised, because when you hear somebody talking about a group, you presume they’re all going to be singing, or playing, together. But what I heard was a fantastic hour of solo traditional singing. And alot of people, I think, when they hear of an album of unaccompanied traditional singing, they think: that mightn’t be too easy to listen to, or I might just listen to a few songs now, and a few songs later. But let me tell you that when you listen to The Cuckoo’s Note, and just listen to the variety in the singing styles, and in the types of songs – it’s an absolutely lovely, lovely production. It’s a lovely way, and it’s a very unusual way, I think, to present traditional singing. Also, when we hear songs put together by local singers, there is often a tendency to stick very rigidly with local songs, for example, or maybe with songs that have been recorded by other people. But what you have on the Whisht! album, The Cuckoo’s Note, is a great mixture of some songs that we’ve all heard before, some songs that Wexford people maybe have heard before, and also some songs that none of us have probably heard before. So it’s a great mixture in that respect, and there are also a couple of Irish language songs in there as well, which was really nice to hear. Recorded in Liam Clancy Studios, when you listen to the CD, you can really hear the result of the work and the care that went into the recording, and the post-production of the CD. And also into the sleeve-notes, which are really beautifully done. The word Whisht or éist means to be silent, stop or listen, and listen you will to these six top exponents of the unaccompanied song in the traditional idiom…. sixty minutes of wonderful ballad singing. Lovers of Irish song will be enthralled by this album. It is wonderful to see the best singers in the county coming together to pool their talents for our enjoyment. Each song and singer is a delight. 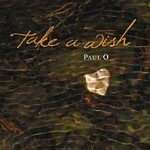 Ten of Paul’s contemporary folk compositions on his debut solo album. Wexford-based singer-songwriter Paul O’Reilly blends folk, country and traditional styles in equal measure on this impressive self-produced debut. Though claiming influences from James Taylor, Neil Young and Bob Dylan among others, his main inspiration appears to lie much closer to home. Jimmy McCarthy is one clear influence on his song writing approach – you could easily imagine Mary Black performing a song like ‘Be With You’ or the poignant title track. With its shuffling country rhythm, ‘Expressions’ is more than slightly reminiscent of Mick Hanley’s ‘Past The Point Of Rescue’ while the tin whistle accompaniment lends a song like ‘Run Now Run’ a strong traditional feel. His lyrical subject matter is in the main introspective, dealing with life and relationships in all their complexities. But he’s not afraid to tackle serious issues such as a failing marriage (‘Leave The Key Behind’) or domestic violence (‘Bobby’s Tears’). He even broaches the thorny subject of current Middle-Eastern politics on ‘Arabs Tent’ – a song that sonically evokes the spirit of Moving Heart’s classic ‘Hiroshima Nagasaki (Russian Roulette)’. While the production and acoustic accompaniment is stripped down with minimal studio gimmickry, the arrangements are sympathetically carried out. O’Reilly is an impressive guitar player too, as evidenced by the fret-work on ‘Ode To See’ which is very much in the style of Paul Brady’s ‘Arthur McBride’. O’Reilly shows plenty of promise here. I first came across the superb musical talent of Paul O’Reilly at the Wexford Songwriters Club, at one of our regular Tuesday night shows in Finnegan’s, South Main Street, Wexford. Paul is a powerfully melodic singer, with a masterful touch on his well-crafted guitar accompaniments. So it was an exiting prospect to be asked to review his album Take A Wish, and this recording certainly didn’t disappoint. From the soulfully plaintive, Ode to See, to the more upbeat Expressions, to the country roots feel of Leave the Key Behind, Paul takes us down a diverse musical road that is paved with expressive lyrics and richly woven accompaniments. Throughout the album, Paul’s words are a prime example of how to express feelings without soppy sentimentality. The opening love song, Be With You, hits the mark without descending into worn-out clichés. There is social comment here too. The Arabs Tent, encompasses the wars in the Middle East and shows off the virtuosity of Richard King (formerly of Threepenny Opera) on lead guitar and dobro. Paul demonstrates the breadth of his scope in The Prom Song, which deals with a down-and-out man and his life. This is a folk song in the Stockton’s Wing mode, with a haunting whistle accompaniment from Padraig Sinnott of Fonn. In fact, in the course of this recording, Paul surrounds himself with other great musicians. Shelly O’Reilly gives outstanding piano performances on Be With You and Goodbye, while Siobhan McCormack adds a beautiful female dimension to the vocals on Leave the Key Behind. M.J. O’Reilly’s harmonica on the heart-rending Bobby’s Tears is subtle and tuneful. Throughout the album, and especially on the title track, Paul’s vocals and harmonies are well polished. Also, his bass and bouzouki playing both give perfect rhythmic depth his well-crafted arrangements. Paul recorded, engineered and mixed these songs at his home and the professional quality of this album is a testimony to this man’s range of talents. Kieran Goss better move over, there is a new kid, and a new voice, on the block.